Houji is Shishio's minion, and, aside from Yumi and Soujirou, he is closest to him. He used to be an official in the Meiji government but lost faith in it when he saw no one in the government worthy of controlling the country. He abandoned his position in the government and eventually met Shishio. Houji, too, envisions Japan as a mighty power led by Shishio, ruling with the principles of basic animal survival. 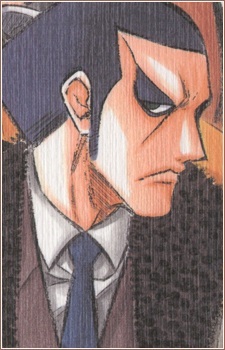 Houji is indeed unique; although he is not proficient in any fighting style, he is a cunning organizer and possesses frightening leadership qualities. His skills as a staff officer figure are quite amazing; he even manages to purchase Rengoku—the gigantic ship, which gets destroyed by Sanosuke, Kenshin, and Saito—on the black market. Houji was 'baptized' by Shishio's intense body heat to kindle in him a belief in hell. Houji strongly believes in Shishio's strength as he throws away a gun he had hidden after learning of Shishio's fifteen minute limit. He is in utter disbelief when Shishio is finally defeated by Kenshin and then attempts to destroy the complex the fight took place so that if Kenshin died, there would be no victor; thus Shishio would never have been beaten. As the complex collapses, Houji was saved by Anji and Soujirou. Anji convinces Houji to surrender himself to the police, and Houji agreed with the intent of using the criminal courts to project Shishio's ideals and plans. At the end of the Shishio arc, it was revealed that Houji committed suicide in prison after government officials decided that his voice was too dangerous and refused to grant him a trial. After slitting his throat, he wrote a message on the wall with his own blood: "This world is dead to me now. I go to follow my master to hell". The message was directed at the Meiji government to convey Houji's disgust with the regime and his loyalty to Shishio. He is last shown in Hell with Shishio and Yumi, vowing to follow Shishio when he declares that he will conquer Hell.